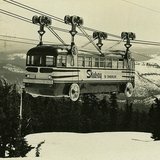 For anyone interested in the best vintage ski photos illustrating the early days of skiing, I would recommend visiting our Instagram-account Old.schoolers - partly named in appreciation of Newschoolers! Why you guys always following me then unfollowing me 2 hours later? Or you could just go buy a photo book and actually study the work and learn something. I'd drop a name or two but I don't want to give them anyone else's work to steal so pm me and I'll send you a few.